Utilize all the space possible with Celina's large frame tent. The striped top is 95% bonded with heat sealed construction and is also equipped with reinforcement patches at the crowns. Other features of this great product by Celina include highly durable galvanized steel poles, scalloped valances with vinyl binding, required stakes and ratchets, user-friendly instructions, and a polyester side curtain rope that is securely held in place with 1 inch polyester webbing that is sewn in every 15 inches of the boarder. What is the difference between a Frame Tent and a Pole Tent, please? And are galvanized steel poles stronger and longer-lasting than aluminum poles? How much heavier? Thanks very much! 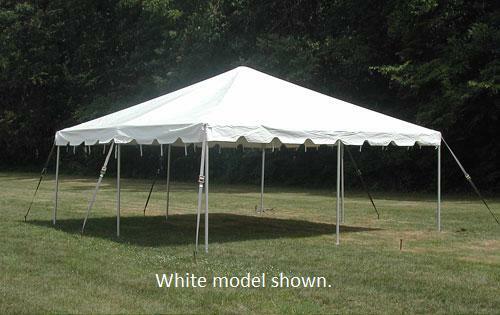 A pole tent has a center pole in the middle were the tension of the tent is whereas a frame tent does not have center poles and it has anchors that hold the tension. Steel poles are normally stronger than aluminum.